It’s an exciting time for modern rustic design! Home/Posts/It’s an exciting time for modern rustic design! From organic rustic console tables to live edge tables — these are the trends driving modern rustic design forward. While rustic design is engineered to stay true to its minimalist natural filled roots, many have explored new ways to bring fresh life to the aesthetic. This year has been no exception, with the likes of the Philips Collection1 and our very own Modern Root Console tables2, designers and companies are driving a new way of thinking about how to further blend design and nature. By presenting natural escape in each of these pieces, modern rustic designers can provide sustainability and a feeling of calm reflection to any space through their works. This is especially true, with our River Runs Through It unique coffee tables3. As natural tones start to take shape more clearly when you create a flowing sense of trails, it delivers a feeling of outdoor excitement and adventure all year round. Live edge tables deliver a natural shape to your home. We all know that the edges and shapes to things matter. Let’s be honest, some edges are just too “edgy” while others are just “perfect”. With Woodland Creek Live Edge Tables4 you have the opportunity to find the best edge for your space! We offer a wide range of natural dining tables and table tops, with our best sellers being our Modern Live Edge Dining Table5, and our Modern Table made with Live Edge Top6. The Modern Live Edge Dining Table offers a more classic log cabin aesthetic, while the Modern Table made with Live Edge Top can fit perfectly into your Rustic Brooklyn home. Speaking of dining tables, here is an awesome one we found on Houzz that really shows the potential of live edge table tops7. Dreaming of rustic barnwood bathroom vanities? We sure are! From powdering the nose, and freshening up, to making sure your cowboy hat is placed just right before you head out for the night; washrooms play an important role in your personal well being. So why not match this to your style? Uplift your morning with a bathroom vanity you truly love using. We have everything from barnwood vanities8 to salvage/reclaimed wood vanities9; we are sure you and your loved ones will find the best unique rustic bathroom vanity10 for your space! 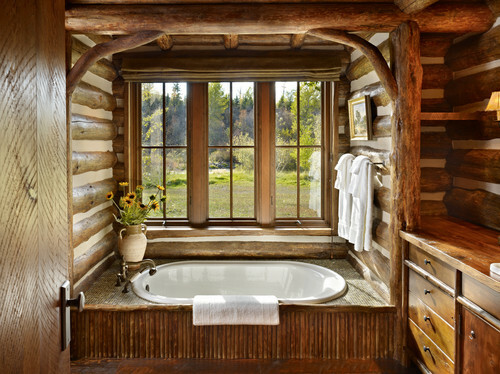 This rustic Paradise Valley bathroom11 offers a great starting point for fresh ideas on your next remodel. Need a second or third opinion? Call one of our modern rustic design consultants at (231)668-9125 today. We are always more than happy to help you choose the right piece for your space. We are a Best of Houzz Customer Service company and pride ourselves and delivering quality feedback and insight when available. If you prefer to order online you can do so, with our easy checkout process! 2018-12-08T16:13:15+00:00	By Robert Evina|Design|Comments Off on It’s an exciting time for modern rustic design!